Where can you r Economics degree take you? For two recent graduates, the answer is: a prestigious master’s degree program at China’s Tsinghua University. 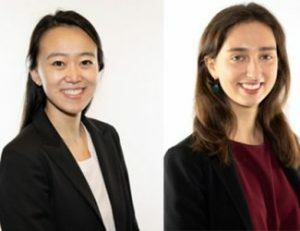 Alice Huang, a 2016 graduate and Emily Venturi, a 2018 graduate, have been selected for the 2019 cohort of the Schwarzman Scholars program. This elite scholarship modeled after the Rhodes Scholarship was founded by Blackstone co-founder and CEO Stephen A. Schwarzman. There are 140 Schwarzman Scholars chosen from around the world each year, and this year two came from Gardner Hall. Emily is from Trieste, Italy. She graduated from Carolina in 2018 with highest distinction in political science and economics. Emily currently works in the Office of the United Nations High Commissioner for Refugees in the Division of Resilience and Solutions. Alice is from Chapel Hill. She graduated from Carolina in 2016 with highest distinction in economics and mathematics. Alice currently works in New York City as an associate analyst and research assistant for NERO Economic Consulting. You can read more about them in the University’s post .